Press Genepy being filmed in the workshop by people from the BBC Academy last Thursday 2nd October. I like to add a post to my blog on a Friday, but this week it just didn’t happen – it’s certainly been a break from the routine these past couple of days. First, Open Studios. Such an enjoyable experience. The first week was quiet with mainly friends for company – they were most welcome. However I also received a visit from Ann Frances Hall, who has her own website at http://www.elizabethanroundels.co.uk and I think I may devote a post to her alone. The following weekend was very different – we hosted a party, and the day was spent in a scramble of tidying, preparing followed by the event itself. Next day came an equally frantic round of clearing up – just in time for a visitor who spent an hour with me and we had a good old chat about lino and other aspects of printmaking. It was a beautiful day, 24 C for late September, and after my visitor left I fell asleep in the garden. 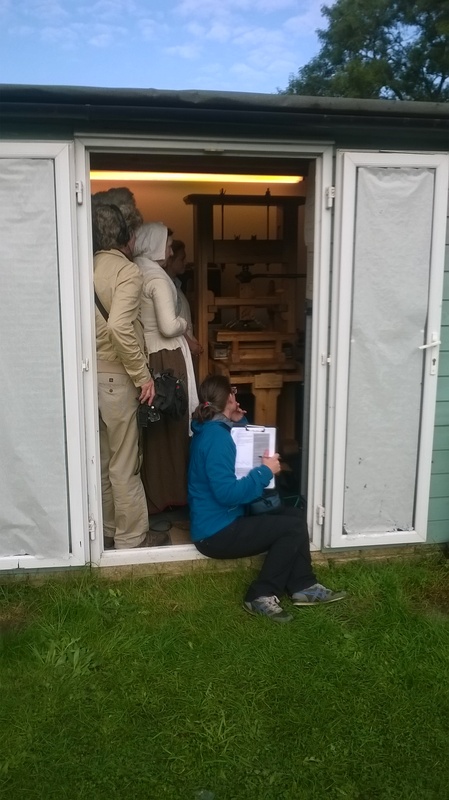 So ended Open Studios, but this week Press Genepy has been filmed by the BBC as a training exercise for new directors. So far, so intense, and now the race is on to finish my print of Thaxted Church in time for the Craft Fair being held there on Saturday 18th October. I have to finish the cut today, so that it can be mounted on plywood, and next weekend it will be made up into a forme with the addition of letterpress. Well…I think I’d better get back to work! My progress to date on the print of Thaxted Church. 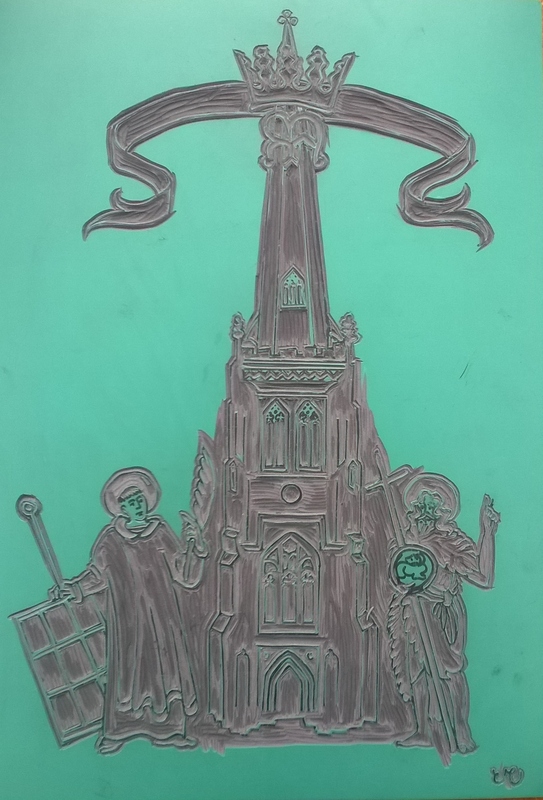 The design shows two of the saints to which the Church is dedicated, St Lawrence and St John the Baptist. The third saint, St. Mary, is represented by the cipher “MR” and the crown of the Queen of Heaven.